FOLLOW THIS STEP BY STEP TUTORIAL TO MAKE A NOTEBOOK WITH A LEATHER WRAPPED COVER AND TABBED SIGNATURES THAT MAKE UP THE BLANK PAGES INSIDE. THIS EASY WAY GIVES YOU A WONDERFUL CUSTOM NOTEBOOK FOR BACK TO SCHOOL SEASON! WITH A MULTITUDE OF LEATHER CHOICES, THIS CAN BE AS STYLISH AS YOU'D LIKE! THIS TUTORIAL WILL BE BROKEN DOWN INTO THREE PHASES, THE FIRST WILL TEACH YOU HOW TO GET THE TABBED PAPERS TO MAKE YOUR BOOK SIGNATURES, THE SECOND WILL TEACH YOU HOW TO CREATE YOUR CHIPBOARD AND LEATHER COVER, AND THE LAST WILL SHOW YOU HOW TO BIND YOUR SIGNATURES AND NOTEBOOK ALL TOGETHER ... LET'S GET STARTED! 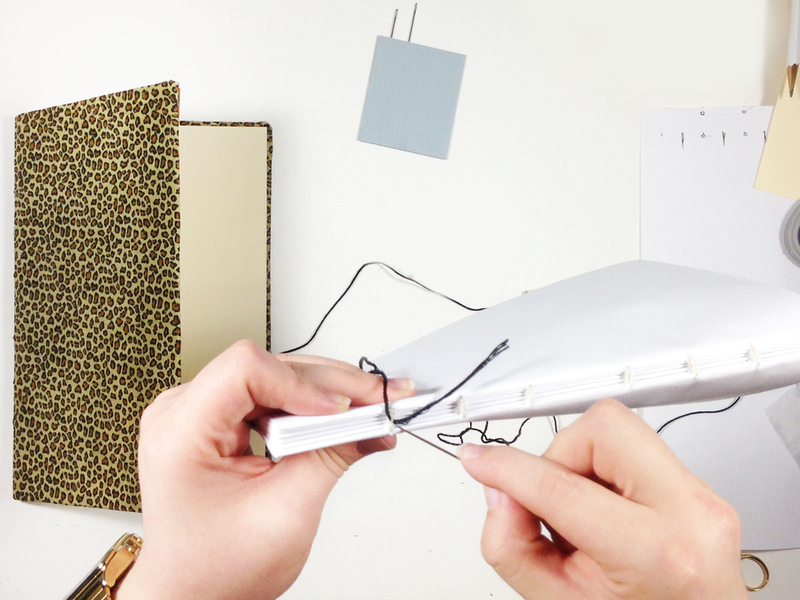 DECIDE ON THE THICKNESS OF YOUR NOTEBOOK AND GRAB ENOUGH PAPER FOR THE INTERIOR OF YOUR BOOK. I WENT WITH THE STANDARD 8 1/2" X 11" PRINTER PAPER AND GRABBED 30 PIECES (I'M GOING TO HAVE 6 TABS WITH 10 PAGES PER TAB WHICH IS 5 WHOLE SHEETS OF PAPER). ONCE YOU HAVE ALL YOUR PAPER GATHERED, GO AHEAD AND FOLD EACH PIECE IN HALF AND MAKE SURE THE EDGE IS REALLY WELL CREASED WITH A BONE FOLDER (OR YOUR FINGERNAIL FOR YOU BUDGET GALS!). ONCE YOU HAVE ALL 30 PIECES OF PAPER FOLDED CRISPLY IN HALF, TAKE A CLEAR RULER AND MARK 3/8" IN FROM THE EDGE OF YOUR PAPER (NOT ON THE FOLD) WITH A PENCIL. THIS IS THE DEPTH THAT WILL GET CUT AWAY TO REVEAL THE TAB SHAPE LATER ON! BECAUSE YOU'LL BE TRIMMING THE TABS WHILE THE PAPER IS CLOSED, YOU ONLY NEED TO MARK ONE SIDE . ONCE YOU HAVE ALL YOUR PAPERS MARKED, YOU'LL WANT TO GROUP THEM INTO WHAT WILL BE YOUR SIGNATURES. I SEPARATED OUT 6 GROUPS OF FIVE PAPERS BECAUSE I'LL BE HAVING 6 TABS GOING DOWN THE RIGHT HAND SIDE OF MY NOTEBOOK. TO CREATE THE SHAPE OF MY TABS I'M USING A FISKARS TAG SHAPE TEMPLATE AND USING THE EDGE TO GET A CONSISTENT TAB SHAPE. TO MAKE SURE MY SPACING IS CORRECT I FIRST MADE ONE CHEET SHEET WHERE I DREW ALL 6 TABS OUT ON THE SIDE SO I WOULD BE ABLE TO USE THAT TO MARK THE TABS ON MY SIGNATURES. PLACE YOUR CHEAT SHETT DOWN ALONG THE 3/8" LINE YOU HAVE IN PLACE AND MATCH UP THE EDGES. USE THE EXTENDED LINES OF YOUR TAB TO MARK THE STARTING AND ENDING POINTS OF YOUR TAB ON YOUR PAPER. HERE I AM MARKING THE FIRST OF THE SIX TABS . THEN, TAKE YOUR SHAPE TEMPLATE AND DRAW THE TAB SHAPE (JUST LIKE YOU DID TO COMPLETE YOUR CHEAT SHEET). CONTINUE THIS PROCESS FOR ALL 30 PAGES AND AFTER YOU HAVE 5 FOR EACH TAB, SWITCH TO THE NEXT SET OF TABS IN THE SEQUENCE. JUST KEEP DRAWING TAB SHAPES UNTIL ALL YOUR PAPERS ARE GONE. THEN, I WENT BACK AND ERASED THE 3/8" PENCIL LINE FROM WHERE MY TAB WAS DRAWN SO THAT YOU CAN'T SEE IT ANYMORE! ONCE YOU'RE FINISHED YOU'LL HAVE A GROUP OF PAPERS WITH THE TABS DRAWN ON THEM AND YOU CAN SEE HOW THE TABS WILL LOOK WHEN PLACED INTO YOUR NOTEBOOK! I FOUND THE EASIEST AND QUICKEST WAY TO TRIM AROUND MY TABS WAS TO SIMPLY GRAB A SHARP PAIR OF SCISSORS AND TRIM EACH PIECE OUT. I DID KEEP EACH PIECE FOLDED, HOWEVER, AND THIS WAS POSSIBLE BECAUSE I HAD SUCH A FLAT CREASE FROM BEFORE WHICH ALLOWED ME TO TRIM THE TWO LAYERS EVENLY AT ONCE. ONCE YOU HAVE ALL YOUR TABS TRIMMED, YOU NEED TO GROUP THEM INTO THEIR SIGNATURES. TO DO THIS, OPEN EACH PIECE AND STACK THE 5 WITH LIKE-TABS INSIDE EACH OTHER. MAKE SURE THEY'RE EVEN AND ALIGNED. TO BIND YOUR SIGNATURES YOU'LL NEED TO PIECE HOLES FOR STITCHING. I CREATED A MARKING TEMPLATE SIMPLY DIVIDING MY AREA EVENLY AND THEN CREATING 6 HOLES. I HELD THAT UP AGAINST THE FOLD OF MY SIGNATURE AND MARKED A CROSSMARK PRECISELY ON THE FOLD WHERE I NEED TO PUNCH THE HOLE. WITH ALL YOUR SIGNATURES MARKED, GRAB A HEAVY DUTY AWL AND PUNCH YOUR BINDING HOLES PRECISELY - MAKING SURE THE HOLE IS LARGE ENOUGH FOR YOUR NEEDLE TO FIT THROUGH COMFORTABLY. WITH THIS, ALL YOUR SIGNATURES ARE PREPPED FOR BINGING AND YOU CAN SET THEM ASIDE AND MOVE ON TO THE NEXT PHASE - YOUR LEATHER WRAPPED COVER! GRAB A PIECE OF CHIPBOARD - THIS WILL BE THE BASE OF YOUR COVER. NEXT YOU'LL NEED TO MARK IT. TO DO SO, I MARKED OUT AN 8 1/2" X 11" RECTANGLE AND THEN ADDED 1/2" ALL THE WAY AROUND. I ALSO MARKED THREE LINES DOWN THE CENTER, ONE, DEAD CENTER, AND TWO 1/4" ON EITHER SIDE OF THAT. THESE WILL BE SCORE LINES SO THAT THE CHIPBOARD CAN FOLD PROPERLY. ONCE YOU'VE MARKED YOUR COVER PROPERLY, GRAB A METAL RULER AND SHARP X-ACTO KNIFE. BEGIN BY SCORING THE THREE CENTER LINES. CUT ENOUGH TO MAKE IT FOLDABLE BUT DO NOT CUT ALL THE WAY THROUGH YOUR CHIPBOARD. ONCE YOU'VE FINISHED SCORING, CUT OFF ANY EXTRANEOUS CHIPBOARD THAT ISN'T PART OF YOUR COVER. I CUT OFF A 2 1/2" SECTION BELOW MY COVER. YOU WANT YOUR CENTER SCORE LINES TO OPEN UP, THIS WILL ALLOW YOUR BOOK TO FOLD PROPERLY. TO CREASE THEM, I LAID MY SCORE LINES ALONG THE EDGE OF A TABLE AND PUSHED FIRMLY TO CREASE EACH OF THE THREE SCORE LINES. ONCE YOU HAVE YOUR CHIPBOARD PREPPED, YOU'LL WANT TO TRIM YOUR LEATHER TO WRAP THE CHIPBOARD WITH. I PLACED MY CHIPBOARD DOWN AND PRESSED FIRMLY TO TRIM AROUND TWO SIDES OF THE BOOK WITH MY X-ACTO KNIFE. ONCE TWO OF THE SIDES WERE CUT OUT, I SHIFTED THE CHIPBOARD 1" AWAY FROM THE CUT LINES AND CUT THE REMAINING TWO SIDES. THIS ALLOWS ME TO KEEP A 1/2" BORDER AROUND THE ENTIRE COVER COVER FOR WRAPPING THE LEATHER BUT USING THE CHIPBOARD AS A STRAIGHT EDGE ENSURES THE LEATHER STAYED FLAT WHILE I WAS CUTTING IT. TO ADHERE THE LEATHER TO THE CHIPBOARD, WE'RE GOING TO BE USING DOUBLE SIDED FUSIBLE (AKA STITCH WITCHERY) TRIM A PIECE OF FUSIBLE TO THE SIZE OF YOUR CHIPBOARD. HEAT UP YOUR IRON AND, IN THE MEANTIME, PLACE YOUR CHIPBOARD, FUSIBLE, AND LEATHER DOWN ONTO YOUR IRONING BOARD (IN THAT ORDER). ONCE YOUR IRON IS HOT, APPLY LONG STEADY PRESSURE TO YOUR BOOK COVER (LEATHER UP). LEATHER IS FIND TO BE IRONED YOU JUST WANT TO BE SURE, SINCE THE SKIN IS FLEXIBLE, NOT TO PULL THE IRON BUT SIMPLY LIFT AND PLACE IT TO HEAT THE VARIOUS SECTIONS OF THE BOOK. YOU WILL HAVE TO LEAVE THE HEAT ON EACH SECTION FOR A GOOD AMOUNT OF TIME FOR THE HEAT TO WORK THROUGH THE THICKNESS OF THE SKIN AND MAKE THE FUSIBLE WORK. IF YOU THINK IT'S DONE, FLIP IT OVER AND CHECK ALL THE EDGES TO MAKE SURE EVERYTHING IS FUSED PROPERLY BEFORE MOVING ON. ONCE YOU'VE PROPERLY ADHERED THE OUTSIDE OF THE COVER, IT'S TIME TO WRAP THE LEATHER AROUND TO THE INSIDE. 7.2 PLACE FUSIBLE ONTO CHIPBOARD ON ONE SIDE OF THE NOTEBOOK. FOLD IN ONE CORNER. WHILE HOLDING THE FOLDED CORNER, FOLD UP TIGHLTY THE REST OF THE LEATHER ON THAT SIDE. WHILE BEING HELD, PLACE IRON DOWN FIRMLY ON THE RIGHT HALF OF THE EDGE. WITH THE IRON SITTING TO HEAT THE FUSIBLE, FOLD THE SECOND CORNER AND THE REST OF THE EDGE BEFORE IRONING THAT AS WELL. 7.3 IT DOESN'T HAVE TO BE PERFECT, IT JUST HAS TO BE WRAPPED. THE INTERIOR WILL BE FINISHED WITH CARDSTOCK SO DON'T WORRY IF YOURS LOOKS AS UNEVEN AS MINE DOES! YOU'LL REPEAT 7.2 FOR ALL FOUR SIDES UNTIL IT LOOKS LIKE THE PICTURE BELOW. SIMILAR TO THE PUNCHING YOU DID TO THE SIGNATURES, YOU'RE GOING TO LINE UP YOUR TEMPLATE AND MARK YOUR HOLES WITH A PENCIL DIRECTLY ON THE CENTER SCORE LINE. WITH THE MARK IN PLACE, GRAB YOUR HEAVY DUTY AWL AND PUNCH A GENEROUS HOLE THROUGH THE COVER OF YOUR BOOK. AS I MENTIONED, WE'RE COVERING THE INTERIOR - SO TO DO THIS, YOU NEED TO TRIM TWO PIECES OF HEAVY WEIGHT CARDSTOCK (OR MANILA FOLDER LIKE I HAVE HERE) INTO TWO 5 1/2" W X 8 1/2" H SHEETS. THEN COVER THE INTERIOR WITH DOUBLE SIDED TAPE AND PRESS THE CARDSTOCK DOWN FIRMLY WITH YOUR HANDS. YOU'LL BE FINISHING THE SPINE NEXT AND WHEN IRONED ALL TOGETHER, THE ADHESIVE FROM THE DOUBLE SIDED TAPE WILL MELT SLIGHTLY AND FIRMLY ADHERE THE PIECES. TO FINISH THE SPINE, WE'RE GOING TO USE A FLEXIBLE LEATHER PIECE THAT'S FINISHED ON ALL SIDES SO IT LOOKS NICE WHEN YOU OPEN YOUR NOTEBOOK. 10.2 ONCE YOU HAVE YOUR STRIP IRONED IN PLACE, TRIM A FUSIBLE STRIP TO SIZE. 10.3 PLACE THE FUSIBLE AND LEATHER STRIP ATOP YOUR BOOK SPINE AND IRON GENEROUSLY UNTIL THE FUSIBLE HAS ADHERED PROPERLY. ALSO RUN THE IRON OVER THE REST OF THE PAPER TO SLIGHTLY IMPROVE THE ADHESIVE OF THE DOUBLE SIDED TAPE. AT THIS TIME YOU'LL ALSO WANT TO PUNCH YOUR BINDING HOLES THROUGH THIS NEW SPINE PIECE FROM THE EXISTING HOLES IN YOUR BOOK COVER. FIRST, YOU'RE GOING TO BIND YOUR SIGNATURES ALL TOGETHER. TO DO THIS, I SUGGEST GRABBING SOME BOOKBINDING THREAD AND NEEDLES, AS WELL AS YOUR TABBED SIGNATURES AND SOME SCISSORS. 2.1 GRAB ALL 6 SIGNATURES AND HOLD THEM FIRMLY TOGETHER. WITH YOUR KNOTTED THREAD, OPEN THE FIRST SIGNATURE AND PUSH YOUR NEEDLE THROUGH THE FIRST HOLE FROM THE INSIDE OF THE SIGNATURE TOWARDS THE OUTSIDE. PULL TIGHT UNTIL YOUR KNOT IS LODGED CLOSELY TO THE INTERIOR OF THE SIGNATURE. 2.2 PLACE YOUR FINGER INSIDE THE SECOND SIGNATURE TO ENSURE IT'S OPEN TO THE EXACT MIDDLE AND THREAD YOUR NEEDLE FROM THE OUTSIDE OF THE FIRST SIGNATURE INTO THE INTERIOR OF THE SECOND SIGNATURE. 2.3 ON THE INTERIOR OF THE SECOND SIGNATURE, THREAD THE NEEDLE THROUGH THE NEXT HOLE MOVING THE THREAD FROM THE INSIDE ONTO THE OUTSIDE OF THE SIGNATURE. 2.4 WHEN THOSE SETPS ARE COMPLETE, YOUR FIRST AND SECOND SIGNATURES WILL HAVE ONE STITCH LIKE THE ONE SHOWN BELOW ON THE INTERIOR OF THE BOOK AND YOUR THREAD WILL BE ON THE OUTSIDE OF THE SPINE AT THIS TIME. 2.5 YOU'RE GOING TO LOOP YOUR THREAD THROUGH THE LINK BETWEEN YOUR FIRST AND SECOND SIGNATURES BY INSERTING YOUR NEEDLE HORIZONTALLY UNDERNEATH THE THREAD THAT IS EXISTING THERE. THIS WILL SECURE YOU TO MOVE ON TO THE REMAINING SIGNATURES. SHOWN HERE, I HAVE SECURED MY SIGNATURES ALREADY AND AM INSERTING THE NEEDLE INTO THE THIRD SIGNATURE. AT THIS STAGE, IT IS ALL REPEATING. YOU WILL CONTINUE SECURING YOUR THREAD BY LOOPING UNDER THE PREVIOUS SIGNATURE, INSERTING THE NEEDLE INTO THE NEXT SIGNATURE WHICH WILL LEAVE YOUR THREAD ON THE INSIDE, AND THEN RUNNING THE THREAD TO THE NEXT HOLE ON THE INTERIOR OF THE SIGNATURE AND THREADING IT BACK TO THE OUTSIDE WHERE YOU START THE PROCESS OVER AGAIN. WHEN YOU FINISH THE FIRST SET OF STITCHES THROUGH ALL 6 SIGNATURES, YOU MOVE TO THE NEXT HOLES AND DO THE SAME PROCESS. ONCE YOU'RE COMPLETELY FINISHED, KNOT OFF THE NEEDLE ON THE INTERIOR OF THE BOOK BY THREADING IT UNDER THE INTERIOR THREAD AND THROUGH A LOOP. ONCE IT'S KNOTTED, TRIM THE THREAD AND YOU'RE FINISHED. ONCE YOU'VE DONE ALL THAT, YOUR SPINE SHOULD LOOK SOMETHING LIKE THE ONE BELOW. BECASUE OF THE COLOR OF MY LEATHER, I DIDN'T WANT THE TRADITIONAL BOOKBINDING THREAD TO BE THE EXTERIOR BINDING THREAD THAT YOU WOULD SEE, SO I GRABBED SOME BLACK EMBROIDERY THREAD IN ADDITION TO THE OTHER BINDING MATERIALS FROM BEFORE. 4.1 AT THIS TIME, YOU'RE GOING TO TAKE YOUR GROUPING OF SIGNATURES AND WITH YOUR EMBROIDERY THREAD RUN IT THROUGH THE FIRST KNOT OF YOUR SIGNATURE BINDING AND KNOT IT. 4.2 NOW WITH YOUR THEAD SECURED TO YOUR SIGNATURES, PLACE AND ALIGN YOUR SIGNATURES INSIDE THE LEATHER WRAPPED COVER. LINE UP THE EXISTING HOLES IN THE COVER WITH THE BOUND HOLES OF YOUR SIGNATURES. 4.3 WITH YOUR BOOK AND SIGNATURES PROPERLY ALIGNED, INSERT YOUR NEEDLE THROUGH THE TOP HOLE OF YOUR BOOK COVER. ONCE YOUR THREAD IS ON THE OUTSIDE OF THE BOOK, RUN IT DOWN AND INSERT IT BACK INTO THE BOOK THROUGH THE NEXT HOLE. WHEN YOU'RE DONE WITH THIS, THE OUTSIDE OF YOUR BOOK SHOULD LOOK LIKE THE IMAGE BELOW, AND YOUR THREAD SHOULD BE ON THE INSIDE OF THE BOOK. 4.6 RUN YOUR NEEDLE THROUGH THE THIRD HOLE OF THE BOOK OUT TOWARDS THE FRONT COVER AND PULL TIGHT. 4.7 ONCE YOUR THREAD IS ON THE OUTSIDE YOU'LL RUN IT BACK TO THE SECOND HOLE AND TO THE INSIDE AGAIN WHERE YOU'LL CONTINUE THIS PROCESS OF THREADING THE BINDING OF THE SIGNATURES TO THE COVER UNTIL YOU HAVE ONE SOLID LINE OF BLACK THREAD ON THE OUTSIDE OF THE BOOK, LIKE I SHOW YOU BELOW, AND UNTIL YOUR INTERIOR IS SECURELY BOUND TO EACH PART OF YOUR SIGNATURES, ALSO SHOWN BELOW. WITH THAT, YOUR LEATHER TABBED NOTEBOOK IS COMPLETE AND READY TO USE!